When I first started blogging, I used the free service from wordpress.com. I found it very easy to get a blog up and running, in less than 30 minutes I was online. Post a few nice pictures and write something about yourself for home page. You are good to go. 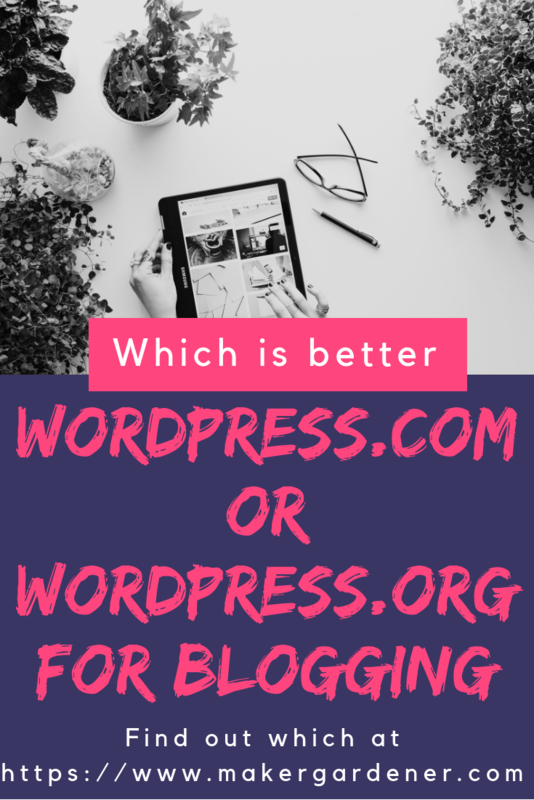 Then after a week into blogging, I upgraded to wordpress.com personal plan so that I could have my domain name for my blog. It does not look professional to have a domain that includes the name wordpress.com. Also, it feels pretty precarious to not own the domain that points to my blog and rely upon a free service that may be subject to change or withdrawal in the future. As you are actually a subdomain of wordpress.com website. Make sure you export/ backup your blog frequently. I do it all the time even I own my own domain as my blog can hacked, or server down for whatever reason. Doing the backup yourself gives you the comfort of knowing your blog can be recovered if need be. After two months into blogging I found the WordPress personal plan quite restrictive because I couldn’t add any videos, use Yoast SEO app or install any plugins that are not in their web design themes template. My permalinks all got a date on it which I can’t remove. With the limited customisation available for my blog, it just doesn’t look good enough. WordPress offer a solution with more features, but it means upgrading to a Premium plan, which in my opinion costs too much for an amateur like me. I am planning to change to either a self hosted service which supports WordPress software or buy a domain name separately and host it myself as my other half has got his own website. Owning a domain name is a great advantage because if you don’t like the web host (blogs take too long to load you lose your viewers interest very soon, or hidden add ons that they don’t tell you when you sign up) you can move you site. You can do this by moving the hosting provider, or using an Internet service called DNS, which means you can just point the DNS entry to where your site have moved host. There are places where you can just buy a domain name without having to sign up for web hosting. It just open up your options as you are able to install plugins and videos. I bought one recently it only cost me £5.99/ year (incL VAT) plus a free email address (yup ending with your domain) compared to other names around on averages charges around £15.00/ year (incl. VAT). Do have a look around. Once you got a domain name you need a minimum of a web host to map the domain you bought onto the web. There are many around that says that they supports WordPress. WordPress software is free to download from wordpress.org, which something to keep in mind. But do you really need one that supports wordpress? No is the answer, there are other options. So do have a look at web hosts that have got either mySQL version 5.6, PHP version 7.2 or greater, Maria DB 10.0 or higher as these are recommendations that supports wordpress software installation. But there are many more options for web hosting, if you want to roll your sleeves up and get technical, you can even get a virtual server and put whatever you want on it and have a lot of control. My other half does this, but it’s not for the faint hearted and adds a layer of complexity when all you want to do is blogging without becoming a system administrator. When I started my blogging journey, I found many guides on blogging on hosted and self hosted were just click-bait and ad laden, trying to sell services. Makes one wonder doesn’t it? Something to keep in mind.